The pink bag emerges from its chrysalis. 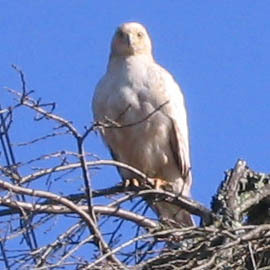 Saw this bird in a not-very-tall tree just outside our house this afternoon. 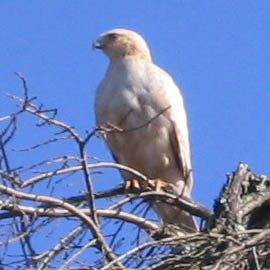 I’ve never seen a bird of prey with that coloring before. I have no clue what it is. Anyone? Odessa is pretty much done, except that it’s a touch on the small side. 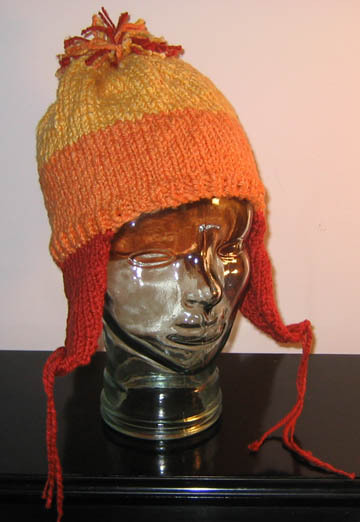 It fits the glass head and Sadie all right, although it feels snug and almost short on me. I’m trying to decide whether that means that my head models are off, or whether it means that it’ll fit a hairless head properly. It was done on #4’s instead of #6’s, so the rows are a little shorter. I knitted the proper length for the body, but I’m wondering if I would have added some extra straight rows among the decreases to make up for the shorter stitches there. 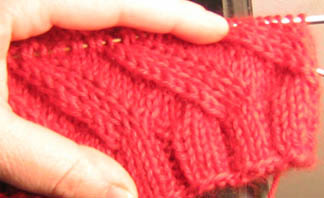 So if I’m going to rip back, now’s the time, before I bind off, when it’s still easy to undo. I took Purr-Zha back to the vet’s office this morning, after he sneezed and blew thick ropes of saliva all over himself. They did a full body X-ray, and even I could see the large spots on his lungs that meant cancer. He’s down to six pounds, for a loss of a pound and a half over the last five months. He’s just had so many health problems that any one of them could have explained his weight loss and lethargy. I don’t blame anyone for not making this diagnosis sooner. For the moment, he’s okay, but it’s a matter of days. After talking with the vet about what he could expect as far as the quality of his death at home versus being put to sleep at the vet’s, we’ve decided to go ahead and end his life at the vet’s. They asked us to check in on Monday and let them know what we wanted to do. So we’re spending some quality time with him here, and unless something dramatic happens one way or the other, we’ll be bringing him in early next week. He’d been on prescription diet, but the vet gave him some commercial cat food, which he ate well. He also got fluids under the skin and some prednisone and such to help him feel better. It did help, as he managed to jump onto the couch and go to sleep. The fact that the prednisone helped him makes me wonder if maybe he isn’t arthritic as well. We’ve been told we can stop the thyroid medication, since he has an empty stomach so much of the time and is probably upsetting his stomach more. I’m off to the grocery store to get him some cat comfort food. Needless to say, he’s also getting some major loving. If nothing else, this will be a nice last weekend for him. I think we’re in the last few days for the cat pictured in the icon. I apologize for the length and rambling quality of the post under the cut. The kindergarten teacher’s bag, she looks pretty much done to me. She wanted big, pink, with novelty yarn, so there you have it. Pre-felting, of course. It’s kind of a “now or never” moment, before it gets felted. If there are changes to be made, such as ripping out the piping or changing the handles (examples only! ), now’s the time. Any comments/suggestions? Y’all know I take criticism and suggestions well. I got my final package from the swap today. It turns out my swapper was the organizer, ! I should have known, she puts so much care into the things she does, and her packages were awesome. 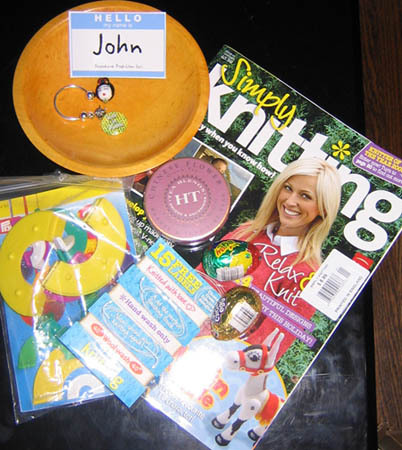 A copy of Simply Knitting, a Brit knit mag. It came with 15 free care labels! Two Cadbury eggs, one of which my daughter has already peeled and poked at. A round tin of green tea. I hadn’t mentioned this in my Livejournal (I don’t think I did, at least) but I haven’t drunk any coffee at all this week. It’s been all green tea. So, as I kick caffeine, this is a perfect addiction. I mean addition. Yeah. One pompom maker set. Believe it or not, I didn’t have one of these. Not pictured: A Godiva Chocolatier bar: Milk Chocolate with Smooth Caramel. No way is my daughter getting her mitts on that. Wooden bowl (because every Firefly fan needs a wooden bowl) has its own closeup because of the cool stuff within. A geisha bead, too cute! A little pin reading “Knit In Public,” which I do daily. And no, the silver thing is not some kind of piercing, it’s a scarf pin with a little ball of yarn on it. Squeeee! 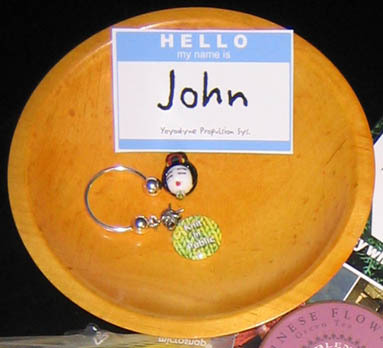 Last but not least, a “Hello, My Name Is John” nametag from Yoyodyne Propulsion. This made me laugh out loud. It’s on my fridge, which is now evil! Pure and simple from the eighth dimension! Fiber Godmother, you are the AWESOMEST. I’m late to pick up my daughter, but a post will follow later! Thank you so much! “Call Me Madam” was very good and may go into my DVD collection soon. For those of you who love musicals – all two or so of you – which ones do you own? Which ones would you like to? Which songs do you put on in the background and dance or sing to while you’re going about your life? I had a couple of weeks of lack of any physical exercise, just from being so busy. I started to crave it. In the mornings, my husband and I both drop off our daughter to school, which is only about a mile away. So today I brought my iPod and walked back home from there. It’s not a lot of exercise, but it does fit easily into my schedule when the weather’s good, and at least I get to stretch my legs a little. Went over to my mom’s yesterday, and brought her a package of TimTams, since she’d been wondering what the heck I was talking about in my LiveJournal. My daughter played happily while Mom and I talked, and I got started on Odessa again, which had been ripped back to the ribbing. Good progress was made on all fronts. Old Odessa, worked on #6 needles with a decrease of SSK (both slipped knitwise). 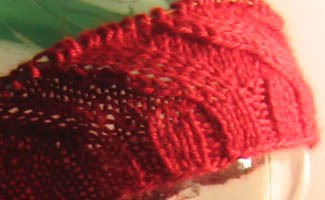 New Odessa, worked on #4 needles wih a decrease of “improved” SSK (first slipped knitwise, second slipped purlwise). I think the modified SSK gives a much neater edge. For those of you who have no clue what the hell I’m talking about (and mainly I’m talking to remind myself about this anyway), the SSK is short for “slip, slip, knit” and is a stitch which combines two stitches into a single stitch, making a decrease which leans toward the left. In the second picture, it’s the stitch that the tip of my index finger is touching. You can follow it down and see it’s more even than the corresponding stitch on the first picture. Yeah, I know you non-knitters still have no clue, nor do you care. 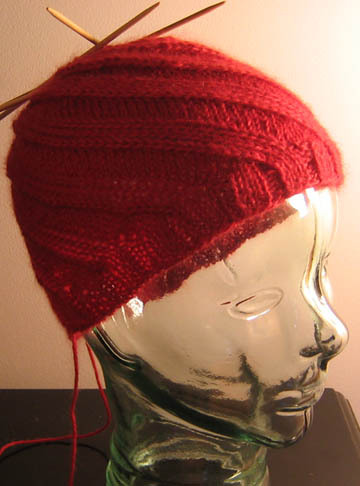 Suffice it to say that I’m happy to have found a new little trick that makes for better-looking knitting. And now, time to watch “Call Me Madam” with Ethel Merman and Donald O’Connor while I work on another cotton Jayne hat, lest I fall behind again on orders. “Call me Madam” was out of circulation for years, so this’ll be my first viewing. I’m a big Donald O’Connor fan, so this should be a nice treat. Yay!